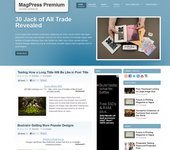 Bioraz is a 2 columns fixed width WordPress theme developed by MagPress.com. This theme comes ready with a user friendly theme options page, featured content slider, footer widgets, Adsense ready and many more. This work is licensed under a CC Attribution-Share Alike 3.0 United States License. Hi i want to add post excerpt in category. Can u please modify this code for me. Full posts are shown in category pages is it possible to make it show the excerpt or the summary of the post alone?? Hai. Please open the index.php and look for the code below div class postcontent. Add is_category() within the if conditional code. Thanks. How to remove that “You are Here: Site Title” ?? I searched all files can’t find where it’s code is located… can someone help me?? It’s inside the header.php > php include breadcrumbs.php. Delete that line.